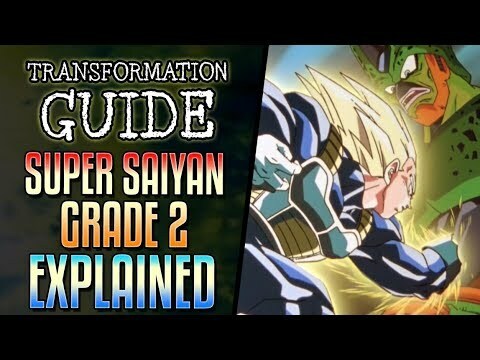 WHAT IS ASCENDED SUPER SAIYAN aka Super Saiyan Grade 2 Explained or Super Saiyan Stage 2 Explained? The form we saw during Super Vegeta vs Cell aka Vegeta vs Semi Perfect Cell was a Super Saiyan Upgrade. We talk Dragon Ball Z Ascended Saiyans and more. First, Grade 4 is not a real grade, because it's the mastery of the base SSJ form. Second, the second and third grade are forms that I believe pumps more energy into the first SSJ form, it's doesn't transform the SSJ form to the next stage and it's over all less effective. I always thought the lightning surrounding Super Vegeta had more to do with the Final Flash than his form, per se. Nice to see a mention of the hair becoming a bit more wild/thick. That aspect of the design tends to get less remembered, due to the more noticeable bulking up of the form. Even the games seldomly alters the hair slightly for that form when it appears in them. I believe Budokai 1 had that extra attention to detail put into Super Vegeta's model, though. 7:31 But that isn't blue electricity, its yellowish white. Only Super Saiyan 2 gets blue. Geekdom is the KING of Dragon Ball. I used to call it Super Saiyan - Hyper Saiyan and Ultra Saiyan instead of ss - ss2 and ss3 I never considered buff saiyans as anything but a buff ssj. Man, the electricity crackle doesn't mean anything. Even Nappa generated electrical sparks when he powered up. I always referred to it as Super Saiyan 1.5. That's how I saw it as a kid. Make a video of something that was explained over a decade ago ? Vegeta couldve went further like trunks did but he realized the weaknesses of the form. Trucks just kept powering up. Vegeta didnt try to power up anymore. Trunks just kept goin & going. Gettin stronger but also getting slower. Do you think that since Goku can use god ki to enhance his regular SSJ transformation (Super Saiyan Blue), he can theoretically use it to enhance his OTHER transformations SSJ2, SSJ3)? Or is SSJ Blue a transformation separate/removed from the regular SSJ line? Dragon Ball Heroes: BEST or WORST Thing Ever?